Here are some of the great Cyber Monday deals on hot sauces and other spicy goodies that came into our inbox this weekend. AmberFyreFoods.com – 40% Off Sale – There has never been a better time to order our Award winning Manhattan Black Cherry Bourbon BBQ and Livingston Parish Hot Sauces. KensPepperWorks.com – 35% off all individual bottles of hot sauce and 15% off already discounted bulk items! Use coupon code BOOM! (exclamation needed). You can get our 1ST PLACE SCOVIE AWARD WINNER, Island Sunshine for as little as 3.90/bottle! ConsumingFires.com – Limited Time Offer $ 17.95 + S&H – Our Holiday Gift Packs Contain All 3 of Our Hot Sauces Including Our Scovie Award Winning Smoked Andouille Sauce, Our Best Selling Smoked Jalapeno Sauce, and Santa’s Favorite, Our Smoked Habanero Sauce. TorchbearerSauces.com – Every order gets 40% off, AND a bonus sample bottle. Orders over $100 get free shipping. DefconSauces.com – Super Cyber Sale! 30% off all wing sauces, horseradishes and dry rubs! This includes the gigantic QUARTS of our wing sauces! CrazyGoodSauce.com – 3 pack gift box for $11.99 containing our most popular products: Shabam! Rustic Red Pepper Sauce, Sweet Heat Smoked Pineapple Hot Sauce, and Crazy Mary Bloody Mary Mix (perfect pour bottle). All gift boxes are stamped with our logo and make a thoughtful gift for the foodie in your life. They also make great employee gifts. All orders over $30.00 will receive a FREE 750 ml bottle of Crazy Mary. BornToHula.com – 50% off our new Carolina Reaper Sauce “Reaper of Sorrow” until Cyber Monday night! Voodoo Chile Sauces & Salsa – Pick your own 6 pack for only $30, plus a free bottle of Peppadew® Mustard. ORDER NOW, while supplies last. ScottyOHottie.com – All products will be 15% off on Cyber Monday! Use coupon code Gobble at checkout. Scotty O’Hotty will also be donating a portion of all website sales to Wounded Warrior Project through December! **Specials** Our wooden holiday spice racks & quad racks are back along with our new “The Motor City Hot Sauce” truck both holding all 4 of our award winning sauces. MildBills.com – We will offer FREE SHIPPING on CYBER MONDAY. Use coupon code 1201CM when checking out on Monday December 1st. Including Bob Coats Chili Mix, Debbie Ashman Chili Mix, Larry Walton Chili Mix and many other chili mixes. VolcanicPeppers.com – Free small hot garlic for any order over $15, Free Volcano Dust 2 for any order over $30, Free Volcano Dust 3 and free shipping for any order over $50. BruceFoods.com – 30% off everything in the store! Enter promo code CYBER30 at checkout. We hope you buy from these fine craft manufacturers… we’ve already ordered goodies from a few of them. 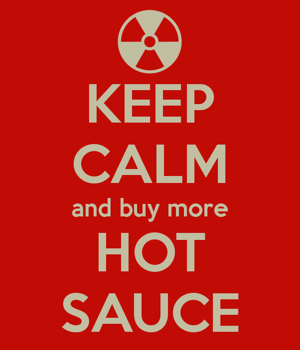 Also, be sure to check out our Annual Holiday Sale post here: http://hotsaucedaily.com/annual-holiday-sale-hot-sauce-bbq-salsas/ for even more savings.